If you’re a fellow devotee of the New York-based television dramas of the early sixties, I’ll bet you’ve wondered the same thing at some point. Hilda was a pretty brunette who appeared on Broadway a lot, starting in the late fifties, and then in some of the last gasps of live television. On stage, Elia Kazan directed her in Tennessee Williams’s Sweet Bird of Youth; the stars were Paul Newman, Geraldine Page, and Rip Torn, and Bruce Dern and Diana Hyland toiled alongside Hilda in the supporting cast. 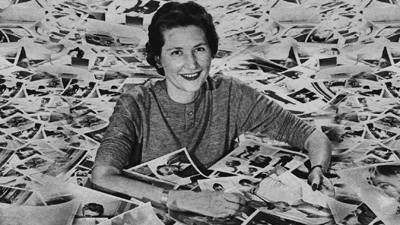 For television, she was on The DuPont Show of the Month and on The Guiding Light for a while in 1963. She played small parts on The Nurses and Route 66 (in the Sam Peckinpah-directed episode “Mon Petit Chou,” with Lee Marvin and playing second fiddle to French import Macha Meril, later the star of Godard’s Une Femme Mariée). If you’re lucky enough to have seen Reginald Rose’s meticulous, devastating indictment of capital punishment, the “Metamorphosis” episode of The Defenders, then you will remember Hilda as the wife of Robert Duvall’s young death row inmate. But it’s most likely that you recall Hilda from Naked City, which seemed to hold a particular affection for her. She appeared on the show three times, first in secondary roles, then finally in a lead in “Alive and Still a Second Lieutenant,” latterly famous as Jon Voight’s television debut. In “Alive,” Hilda played the girlfriend of Robert Sterling’s sweaty, ulcerous business executive (dare I say it? a Roger Sterling type; could the actor be the source of the name? ), who spirals out of control following a violent road-rage incident. Now that you’ve seen the screen grab above, you’ll have some idea of why I became mildly obsessed with Hilda — and with whatever happened to her. Because Hilda’s last credit came in 1964, and there seemed to be no trace of her after that. Did she die young? Marry and raise four kids on Long Island? Hook up with a network executive and ensconce herself on Central Park South? Well, no, none of that, it seems. 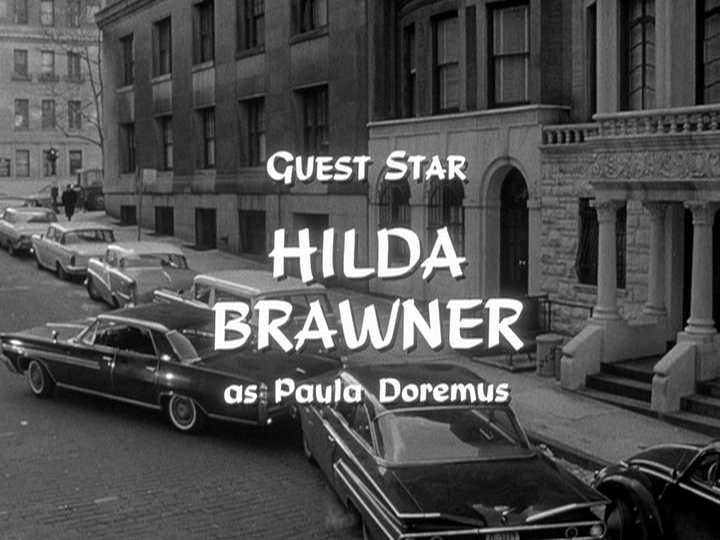 Hilda Brawner, pretty ingenue, changed her name and became Hildy Brooks, busy character actress. Hildy played supporting roles in lots of movies (The Anderson Tapes, Islands in the Stream, Playing For Keeps, Eating) and guest-starred in dozens of television episodes during the seventies and eighties. I remember her as one-third of “A Very Strange Triangle,” a bisexual love story that was controversial when it aired on The Bold Ones in 1971. Hildy still works – she’s in one of the last episodes of Nip/Tuck, one that I haven’t seen yet – although I couldn’t locate her for this piece. Are you out there, Hildy? Incidentally, although I seem to be the first person on the internet to put Hilda & Hildy together, I can’t really take credit for it. Her name change is mentioned in a couple of memoirs, and Jeffrey Sweet’s Something Wonderful Right Away: An Oral History of The Second City & The Compass Players. 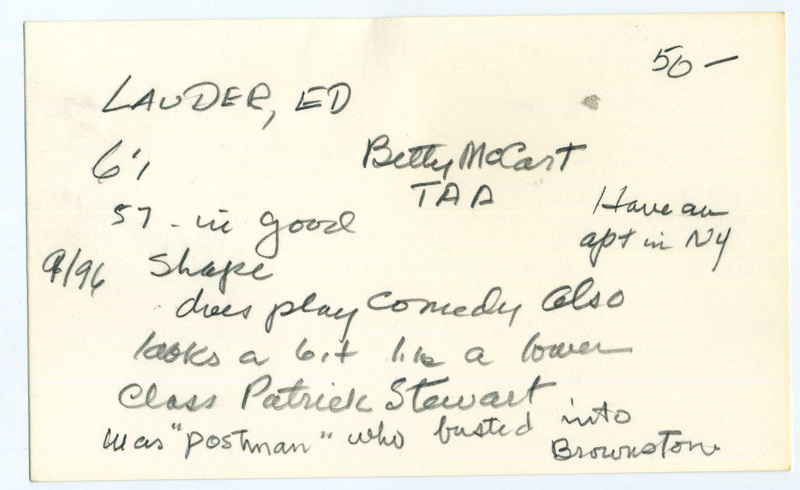 Plus, there was a big clue that I missed for years: under different names, Hilda and Hildy played the same role in the two recorded versions of O’Neill’s The Iceman Cometh, Sidney Lumet’s videotaped videotaped Play of the Week two-parter of 1960 and John Frankenheimer’s film from 1973. Here she is in both. 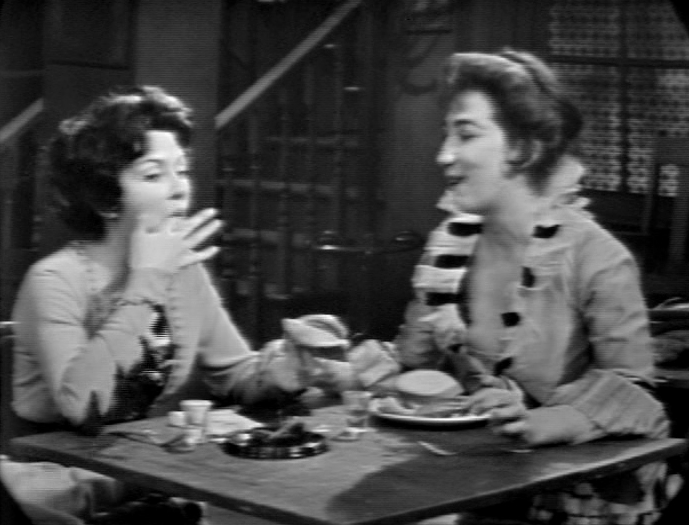 Hilda Brawner (left) and Julie Bovasso as Margie and Pearl, 1960. 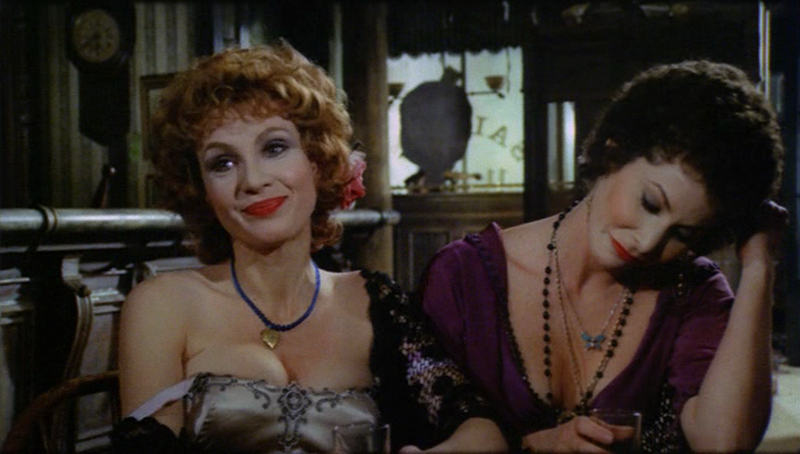 Hildy Brooks (left) and Nancy Juno Dawson as Margie and Pearl, 1973. Below: Hildy Brooks in a 2007 episode of Boston Legal. The piercing eyes, the pockmarked cheeks, the steel-gray hair. If you’re a casting director and you see Tim O’Connor’s angular visage glaring at you from the pages of your player’s directory, you’d cast him as a gangster. Or an Air Force colonel who’s about to drop a lot of napalm on somebody. Or a vindictive prosecutor, tearing into witnesses like a hawk rending a mouse. But if you happened to see O’Connor at work, you might use him differently. His voice has a gravelly edge to match the face, but it is also softer than you expect. Reassuring, even. His smile is welcoming, when he lets it out, and his gait is looser than any predatory lawyer’s or napalming colonel’s would be. He has a wistful quality, and he is more learned in his demeanor than the rough features would suggest. O’Connor is a collection of intriguing contradictions, and he understands that those contradictions are valuable tools for an actor. 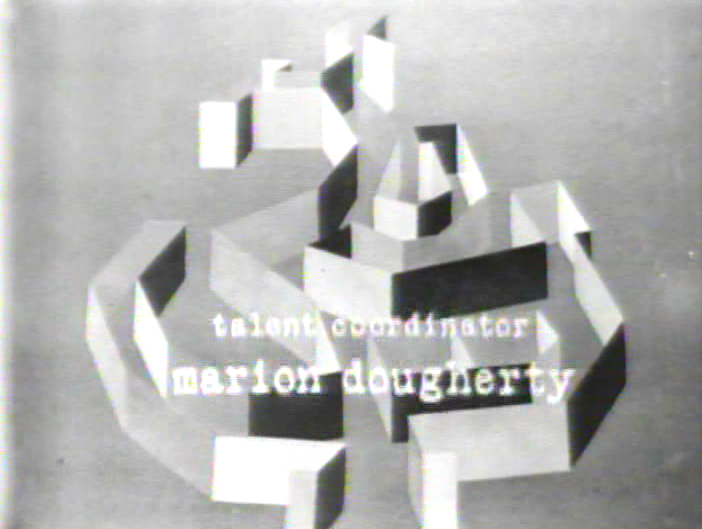 O’Connor first began to gain notice in the late fifties, in the New York-based series produced by David Susskind and Herbert Brodkin. For Susskind, O’Connor played secondary roles in a series of videotaped superproductions, supporting an awesome array of marquee actors including Laurence Olivier, Edward G. Robinson, Jack Hawkins, Jessica Tandy, Maximilian Schell, George C. Scott, Vincent Price, and Boris Karloff. For Brodkin, O’Connor usually played heavies. He had a recurring role as a federal prosecutor in those episodes of The Defenders that dealt with military or national security issues, and played a memorably sadistic pimp to Inger Stevens’s “Party Girl” in an episode of The Nurses scripted by Larry Cohen. So O’Connor played his share of villains, but gradually he broke out of that ghetto, to find his calling out as one of American television’s great everymen. Early on, before he took off in television, O’Connor’s most important stage role had been in The Crucible. He starred as John Proctor, Arthur Miller’s average man who is swept up and ultimately destroyed by the hysteria of history. Variations on John Proctor, ordinary men bound up in ethical or psychological knots, became O’Connor’s specialty. His first showy role in Hollywood was in The Fugitive’s “Taps For a Dead War,” a cliched story of a damaged war veteran, but O’Connor deepened the material by emphasizing the pitiable qualities that lay beneath Joe Gallop’s malevolence. 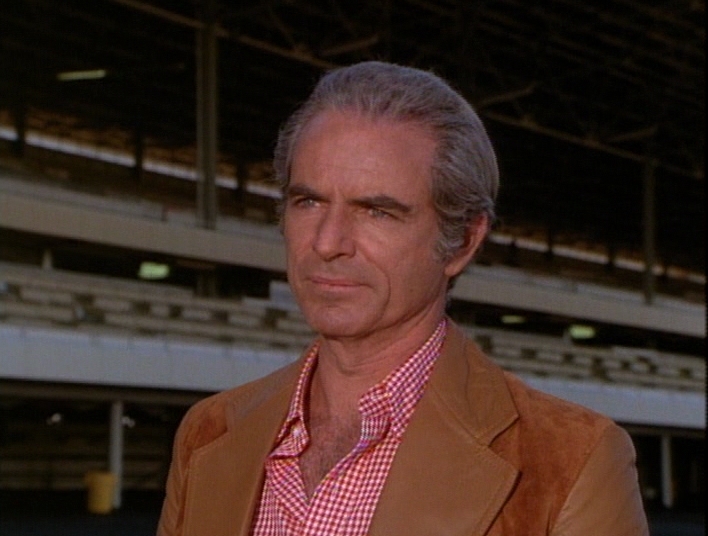 The following year, on Peyton Place, O’Connor created his most complex role. He joined the show during its third month as Elliott Carson, a man unjustly imprisoned for murder and the lynchpin in several intricate, interlocking plotlines. O’Connor’s skill alone won a reprieve for Elliott, who had been marked for death at the end of his initial story arc. The series’ writers hit upon the clever idea of turning the local newspaper over to Elliott, so that he had a pulpit from which to evolve into the town’s conscience. 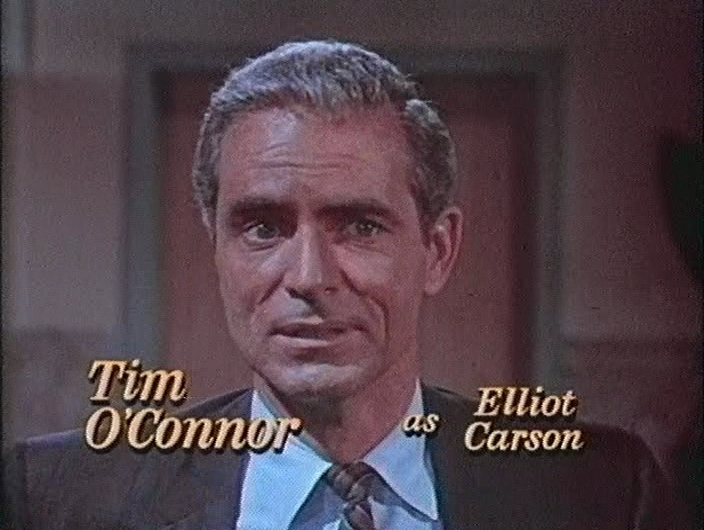 O’Connor played Elliott as a sage, a man with a new lease on life and a reason to exude optimism, but during the show’s long run neither he nor the writers neglected the subterranean well of resentment that Elliott nursed over his lost years in prison. O’Connor’s flawless interweaving of these contradictory strands turned into perhaps the most satisfying exercise in character continuity on television during the sixties. A subsequent generation of TV fans will remember O’Connor as Dr. Elias Huer in 1979’s short-lived Buck Rogers in the 25th Century, and an even later one may recall him as Doogie Howser, M. D.’s grandpa. He still works today, on occasion. 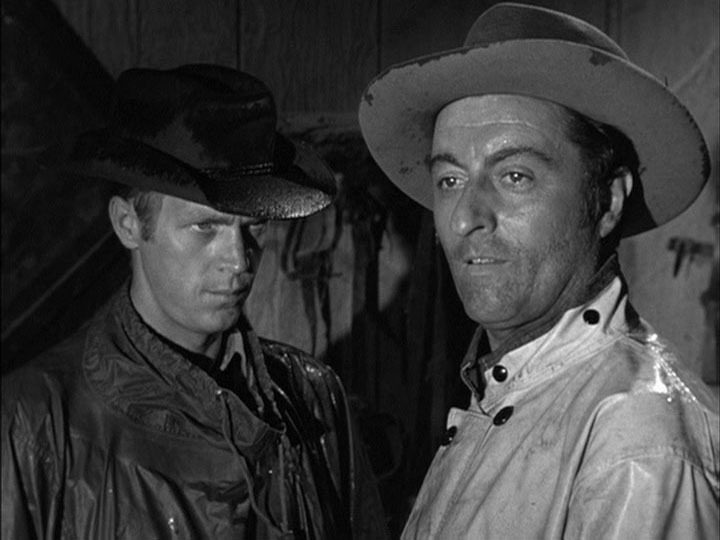 But in this interview, O’Connor takes us back to his early days as an actor in live television and on Peyton Place, and shares his secret for creating multi-faceted characters in a medium that favored simplicity. What was it that made you first start thinking about acting? Was it movies, plays? Oh, it was movies. Movies, particularly. I don’t remember seeing any theater at all. I came up on the South Side of Chicago, and I remember in eighth grade we had a drama teacher that was getting us together for a play. She was encouraging me, and she felt good about it, I remember. Then suddenly, we weren’t going to do it. They probably ran out of money, or the production was going to be too expensive. And I had a really good part, in a very talky play! But at that time, I never dreamt of being an actor. I discovered it in the service as something that I would like to do, but I never dreamed that I ever would. I thought I would become a lawyer. But then I ran into an old schoolmate of mine and he said he was going to a radio school, and I still had some time on my G. I. Bill and it just hit me. I said, Jesus, do it. Go down and try. So I went down to this radio school and signed up and started. This school just taught radio acting, radio engineering, radio announcing. But in three months, I had gone on to the Goodman Theater. I got a scholarship there and finished that up, and then in the third year I started working in local television. What television shows do you remember doing in Chicago? Were you ever on Studs’ Place? 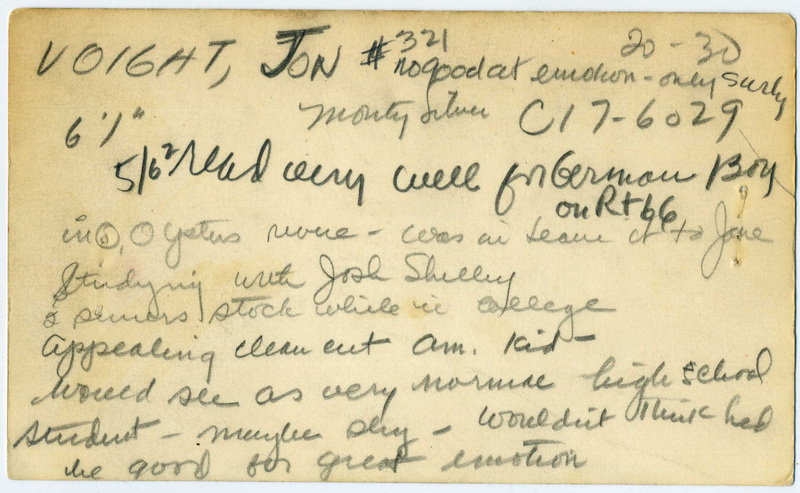 I did work with Studs Terkel in, oh, three or four different locations. He won an award for this show, on drugs seeping into the communities and kids getting hold of them, and I played a young man hooked on drugs who became a dealer. Another show he had that ran for a year was improvised. He’d hire a couple of actors – and I was still in drama school doing this, my third year of drama school – and he would just give you a part and give you kind of what the scene was, and then you’d start making up lines about what was supposed to happen with your character. That’s how we made up a script. He jotted down lines, recorded lines, and then he gave the script to us at the end of three or four days, and we memorized it and shot the TV show. Then there was another show that was very good. It too was improvised. It was an hour show, and it was to do with law and trials. The producer would hire real attorneys and get a real judge, a different one for every week’s show. And then they would cast the rest of us as actors, and give us the premise, a general premise of who everybody was, what they had done, why they were here. Then we would improvise this whole thing. I remember, I got so very good at this improvisation, that if there was something the show was lacking in, this particular producer-director would signal so that I could back out at a certain time, beyond the camera. Somebody would tell me what I was to do, and then I’d get back on stage again. Once I just had to create a scene, because it was awfully dull, or he needed a little more time or something. So I turned against my attorney when he had me on the stand, and then I jumped off the stand and leapt across the prosecutor’s table and at the prosecuting attorney, and slid across and crashed onto the floor. They tossed me back, and the producer-director was down on the floor behind the cameraman. He looked at me and he went: enough. He had enough time. And I went back to the [script]. What did you do after you left the Goodman Theater? I did some summer stock in Chicago. I did a film there, and then I went into a stock company that played summers in a community in the north side of Chicago, in Highland Park. It was called the Tenthouse Theatre. And also in Palm Springs, California, in the winter, so I did summer and winter stock for about three years, and then went to New York and began to work there Off-Broadway. 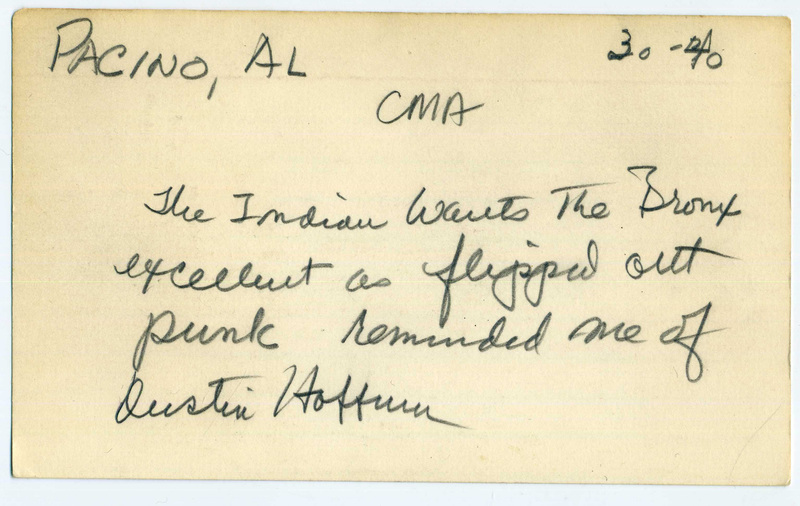 I guess it was about 1953. Then somebody saw me and I picked something up on television, and then I didn’t have any time for the stage any more, except once in a while. One year, the [New York] Journal-American had gone in and done some research to find out who was the most working actor in New York City, and it turned out to be me. I never knew that they were doing this – they came to me and told me, and interviewed me. Was there any particular show that represented a breakthrough for you? Yes. There was a fellow there, a big-time producer named David Susskind, who produced his own television series, and it was all classic shows. He usually hired English actors to do the big one or two leads, and would then complement the rest of it with actors in New York. These were essentially specials, broadcast on the DuPont Show of the Month or Family Classics series. That was it. These shows were taped, with a very early taping device. They only had one in New York City, so that all these various shows had to take turns. So you’d do a scene, and you’d tape it, and you’d want to redo it if something went wrong, but you had to wait. Some other show was waiting in line, and then they’d get back to you and what you were doing. That was it. There was no editing anything at that time. Tell me about some of those roles in the Susskind adaptations. I played Aramis in “The Three Musketeers.” In “Billy Budd,” I played the next character that was just underneath [the villain Claggart], who was a violent person and who hated the captain, and helped Billy. Eventually Billy kind of turned him to his side because Billy was so nice a guy. I had violent, violent scenes that I provoked and carried off. [I had to] swing around and throw myself at people, bring people down. And work with knives. It had all been worked out, and then of course the show begins and the energy is extraordinary. I don’t know how some of us escaped being hurt! Do you remember Graham Greene’s “The Power and the Glory”? I remember that very well, yeah. I had a death scene, and I died with Laurence Olivier there, tending me as I die. Do you know that show? It’s about a priest that’s in Mexico, and he’s running because the police are after him. George C. Scott is the head of the police department after [Olivier], and he races and he gets out of the country to the States and escapes. But then this guy, me, I play the Gringo. I’m dying and I’m calling for a priest. He’s just across the border and he hears that, and [despite] his fear of George C. Scott, he comes back anyway to attend my death, and to hear my confession. I finished up that scene, and we were shooting and we were awfully late. Sir Laurence was planning to be on the Queen Elizabeth on a certain day, two or three days later, and back to England. By this time they had that new tape, so they were able to redo and redo scenes that they thought they could do better. That was my last scene. The stage manager dismissed me and off I went and I changed my clothes, and I was just about ready to leave and I hear this raging down on the stage. I opened up my dressing room door and stepped out, and there was Sir Laurence, and boy, he was really pissed. They had decided to redo my death scene. They thought that there was something else that they thought they could do better, where they had missed a shot on it. They told him that they were going to do it again, and he just raged: “I’m going to be on the Queen Elizabeth Sunday morning, and I don’t give a damn about any of this stuff!” He’d had it. He was probably exhausted, because he was in every scene. Another of your big videotaped shows was Playhouse 90’s “John Brown’s Raid,” with James Mason in the title role. We went down to the location, of Harper’s Ferry, and shot it for ten days. Sidney Lumet directed. The last four days, there were some of us who worked day and night without stop. The show got into real trouble, and the company didn’t want to pay us for playing twenty-four hours a day, four days! So there was a big stink about that. We had to go to the union about it and make some arrangement. The show then turned out so dark, that you could not tell the difference between the people who were white and the guys that were black. It was just so funny. But they broadcast it – they put it on! Do you remember your first leading role in television? The first one I got, the first really large part, was an Armstrong Circle Theater, when I played a guy making a breakout of Alcatraz. This was a live show, and I did the lead as this guy who arranged this whole escape. After the show the head of the U.S. penal system was to be interviewed for about two minutes, to speak on the subject about nobody had ever escaped [from Alcatraz]. And what happened was that about two days before the show, somebody did escape, and they found his clothing underneath the San Francisco Bay Bridge. They could not write him off as having been found, or that maybe a shark got him. That’s what they always said, that nobody had ever been able to survive getting across that water to the mainland, but he did. So we did the show, but the gentleman from the penal system did not appear for the interview. That was late in 1962, and Armstrong was one of the last live shows still on the air. Did you miss live TV, or had you come to prefer working on film? Most actors, it’s the other way around, but I have always secretly preferred film. Why is that? Because you had the opportunity to refine your performance, to do it over again until you were satisfied with it? Yeah, you can do that, you can do them over again. You have an opportunity of seeing downstream and back and forward, of where you’re going, and what you’d like to do in order to get there. Also, I liked doing a job and completing it. No matter how long I had to work, and how many hours – fifteen hours a day – there was an end to it. It wasn’t in a year or so. I enjoyed the stage very much, but I ended up realizing that I preferred working in film and on television over working in a play, which kept you so busy for such a long period of time. I think the longest run I ever had was nine months, when I did The Crucible Off-Broadway [in 1958-59]. I played the lead in it, John Proctor. I replaced somebody [Michael Higgins] that had played it about six months, and then I left it and another actor came in. Around that time, you started commuting to Los Angeles to do a lot of television work. Yes, I was spending a lot of time on airplanes, going back and forth to L.A. What the heck is the name of that hotel, up north of Highland [the Hollywood Tower]? That was the New York actors’ hotel. That was where we all stayed. George C. Scott had a reputation, and I don’t know if it was true or not, that he would go down and rip up the Sunday L. A. Times in the lobby, and throw it down and get back in the elevator and go upstairs. As soon as you mentioned The Fugitive, I thought of David Janssen. We were out on location, it was at night, and we had a scene where he got into a fight with two or three of us. We had marked out the fight, you know, stepped it out, bang, bang. Of course, we were just crashing it up. After the scene was over, he came over and says, trying to apologize, “I’m sorry I hit you so hard in the stomach.” I said that I had not felt it. David was sure that he had actually hit me, though. He was a very nice guy. Another little story about David. David and I and the director were talking, on another episode of that same series, and I said something, kiddingly, about David, to the director, that implied something derogatory, that he wasn’t terribly good in this particular scene. It was so outrageous that I was obviously kidding. And there was just a very brief pause, and David said to the director, “Who couldn’t we get?” [As in,] I wasn’t selected because they wanted me, but because I was the only one left! When you got the regular role on Peyton Place, did you decide immediately that you would relocate to Los Angeles? Yeah, I was making a commitment to stay out there. I was travelling so much, back and forth, that I decided just to go and do it. At that time, I had a house on an island in a lake in New Jersey. It just came up, and my wife and I decided that it sounded like a good idea. We were apartment dwellers and always had been in New York, and this sounded great. It was about an hour out of town, and a long bus ride. I just loved it, the water, the summer and the winters. In the winters we could walk across because it would be frozen. It was our own island, a small island only large enough for one house. Tell me about your character on Peyton Place, Elliot Carson, and your approach to the role. Initially, as it came on, he was in prison and he was just being released, but he was not really guilty of what he was charged with. He was a true blue kind of fellow who felt that what he found in terms of Allison and Constance, the love he felt there and that they felt back, and the family feeling that he had, put him in such a positive ground, that he was a force for good. He was there for what he stood for, in the way he wrote his stories and how he ran the newspaper. That was all sort of brought out with his father. His father and he both worked at the newspaper, and had a lot of everyday conversation about what was happening in Peyton Place. So the discussions were a great deal about self-improvement. He was always kind of nagging himself that he could be better. Elliot had a subtext of anger that was there at the root, and could begin to surface at any time. He really had no in between. His experience of the time he spent in the penitentiary, and his survival in the penitentiary, I think gave him a different sense of being. Although he deeply appreciated where he was and understood what he had, and he did not want to lose it, he wasn’t a person to be bullied. And a couple of shows did come up with that, where that was demonstrated. You worked more with Dorothy Malone, who played your wife, than with anyone else in the case. What do you remember about her? I liked her. She was nice, and she was a pro. She’d come from films into this, and I think there was just this little bit of adjustment for her into television. 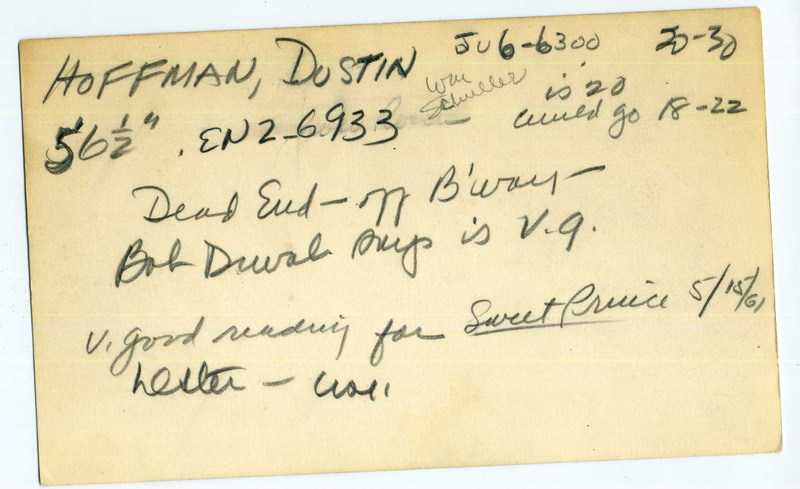 Dorothy had an Academy Award, and she was a very good actress. I seemed to work well with her. We didn’t have a great deal going between each other, but it wasn’t anything that was uncomfortable. Did you and Dorothy Malone choose to leave the show in 1968? No, we were written out. They dropped the characters. The problem, as I understood it, was ABC. The cost of the show, after three and a half years or more, was going up and up and up. ABC had a contract they wanted to stay with, and Twentieth [Century-Fox] was beginning to lose money on making the show, as popular as it was. They looked downstream a ways, and just slowly began to release Dorothy and myself and others on the show, and change the format of the show. And within a year it died, it was dead. When Peyton Place went to three half-hours per week, Fox added a second unit, so that multiple episodes were shooting at the same time. Did that make it more difficult? We went back and forth, from whatever set to the next, whenever we were needed and whenever we were called. It was really crazy, and very, very difficult to do. We had to be on top of three scripts at a time. Did you meet with the writers at all, or have any input into how your character was scripted? No. Maybe the other actors talked with them, but I liked what was done with [my character], and I just kept pushing it. They seemed to write to the person that I thought this guy was. And if I wanted to do something, I just simply did it, and took the dialogue that way, with me. I remember the first scene that I had on the show. I was in prison and I was talking through the bars. I think it was to my father, [played by] Frank Ferguson. We had this very long scene, which was this character’s introduction, and there were an awful lot of nuances in it. The way it was written was one way. The way I played it [was another]. I can’t remember which director shot it, but he was rather happy with what I did that he hadn’t seen, that element in it that I was introducing. I smiled through it, teased it, and I would indicate just via looks that the character was so strained and had so much internal controversy. How would you describe the technique you developed as an actor? Were you a Method actor, or in sync with those ideas? I was probably somewhat in sync with that naturally, just because I never quite thought of myself as working any particular way except to know what I was talking about. To know, thoroughly, the scene. Once I began, I made the lines and the part my own, even though [there were also] ideas and attitudes that were not necessarily my own at all. Which I suppose is part of the Actors Studio kind of thing. I remember, when I would begin, when I’d start and pick up a script I wouldn’t put it down until I knew it backwards. I’d just work on it and nothing else mattered. Sometimes, particularly with a play, I would walk around the script on the table, around and around it, because once I got involved I knew that I wouldn’t be doing anything else. I would be be on it, and I wouldn’t put it down until I had mastered it. I could remember it on the subway. I mean, on the train, the Illinois Central that I would take from downtown Chicago out to the South Side where I lived, or on the street or walking to the theater, so many times I’d be talking the lines to myself. I’d be on the train, looking out the window, and I’d be talking the lines. Often the conductor would come up and be standing there looking at me, wondering what’s the matter with me. In Palm Springs, I can remember walking that mile or mile and a quarter out to the theater from town. In the middle, there was a grocery store that was the only thing in that whole mile on both sides of the road going out to the theater. Somebody said, “Stop!” It was a policeman. “Don’t move! Don’t move!” And across the street, in front of that store, was a police officer crouched down with a gun in his hand, aiming directly at me. This is at night, and I’m in the reflection of the grocery store. He came across very carefully, never taking that gun [off me]. “Put your hands where I can see them!” And of course I did. I knew exactly what I’d done: I had been going through my lines and I must have been talking full blast in the dark, nobody around, and I’d got this cop into thinking I was crazy or something. I told him who I was, and he put me in the car and drove me out to the theater. And he believed me, or he would’ve taken me to the station. But they were looking for somebody that was a little nuts, who had disappeared and had committed some crime. This cop saw me walking down the road talking to myself, and he was sure I was who he was looking for. 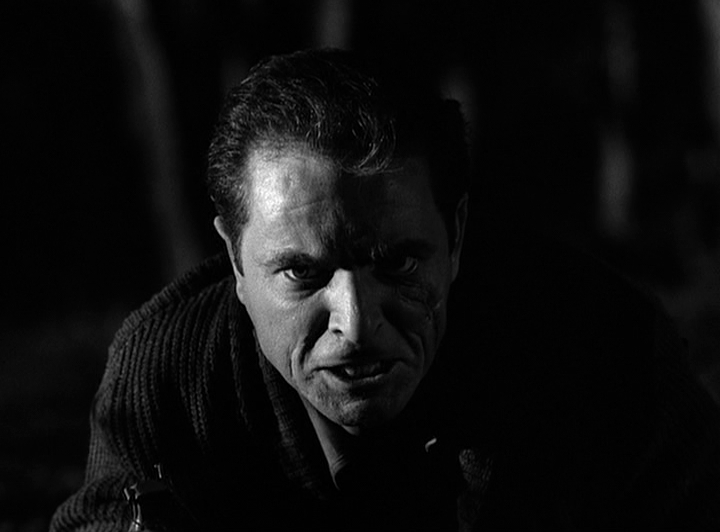 Would you say that you were ever typecast, for instance, in authority figure roles – policemen, lawyers, military men? Well, I never thought of it like that. I just took whatever came along. I never thought in terms of type. I played so many different kinds of guys. How would you approach an underwritten role, where your character was defined as little more than “the cop” or “the father” in a script? I usually approached it within the same sort of fashion. I would play it against what was written. That’s in every part I’ve ever played, anyplace. Particularly in episodic television: you get a character and you play against it. That was my motto. Even a strong part. Even the bad guy. It was usually written as a classically bad guy. I would play against that, and be a smiling, charming guy, as much as I could. Bad guys were bad guys unless you gave them a little twist somewhere. Or good guys were good guys unless you gave them some kind of twist. I might even be marked right at the beginning of the show, but they would have doubts. I would try to give them doubts. George Furth died on August 11 at the age of 75. Furth will be best remembered as a playwright, in particular as the author of the book for three Stephen Sondheim collaborations, including Company. 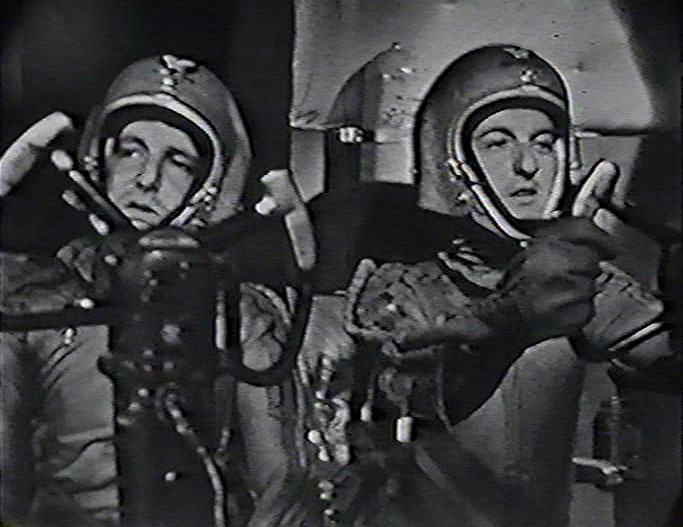 But before and even during his success as an author, Furth was a busy actor, always in medium-sized character parts and mainly in episodic television. He bore a resemblance to Paul Lynde, and also to Charles Grodin, and like both of them he specialized in playing nervous, excitable types, developing a schtick that was sort of a much milder version of Lynde’s. 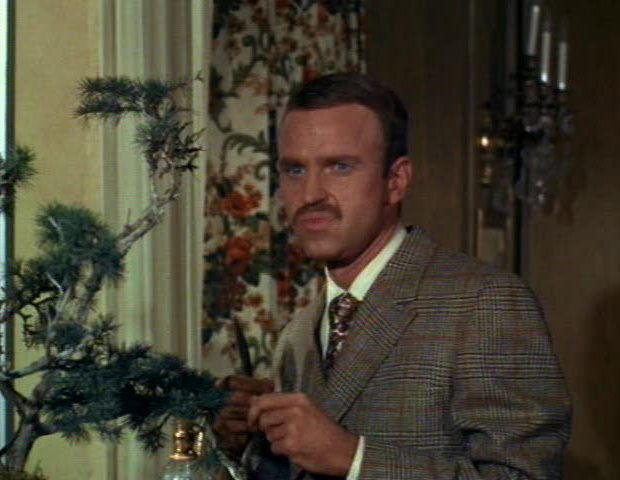 Here he is in a 1967 segment of Ironside (the mustache is a fake). Furth was gay, and like Roddy McDowall, he became such a treasure trove of Hollywood gossip over the years that he declared a moratorium on dishing it to inquiring reporters and historians. When I contacted Furth in 1996, he told me that he did not give interviews, and then in the process of explaining why he answered all my questions anyway, in hilarious detail. 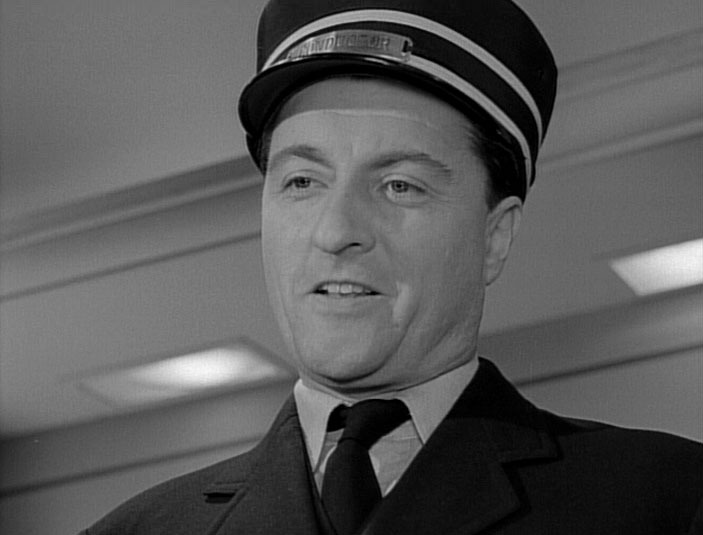 I was only asking about a couple of television episodes in which Furth guest-starred, but his remarks gave me good leads that I was able to follow up with people who would speak on the record. You can bet that had Furth been willing to submit to true interviews, I would have been at the head of that line. The veteran stage and TV actor C. M. Gampel died last week. 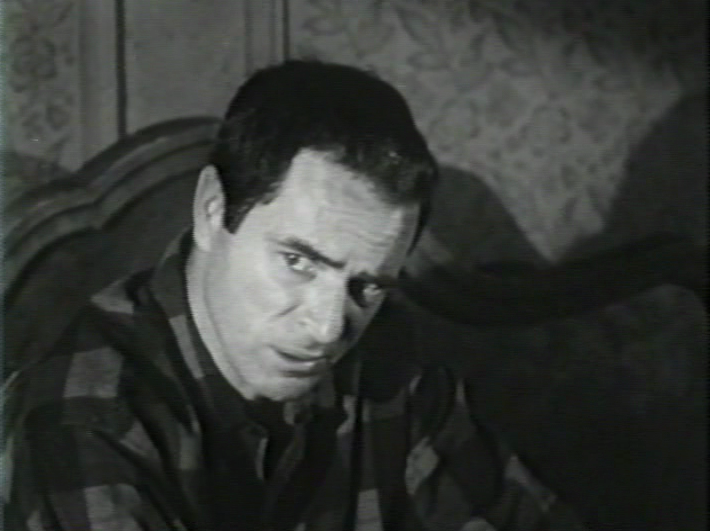 Gampel had at least eight Broadway credits between 1950-1969 and played small roles in movies including Death Wish, Annie Hall, and Hitchcock’s The Wrong Man. And, like almost every young actor living in New York at the time, he was a fixture in live television during the fifties. A check of the reference books and databases puts Gampel in all the big ones: Philco Television Playhouse, Studio One, U. S. Steel Hour, Playwrights 56, Armstrong Circle Theatre, Hallmark Hall of Fame. And since Gampel was a small-part actor, the few credits you’ll find sprinkled around on-line probably just scratch the surface; I’ll bet he was in dozens more live TV segments where he didn’t even make it into the end credit roll, much less the limited range of data that’s been scooped up by the internet. But I think of Gampel in a slightly different context, as one of the pool of small-part actors that was a key ingredient in the rich stew of dramas filmed in (or cast out of) New York a little later: Decoy, Brenner, The Defenders, The Nurses, Naked City, Route 66, Hawk. Gampel (who was credited with about equal frequency as both “C. M. Gampel” and “Chris Gampel”) appeared in episodes of all those series. He’s in “Prime of Life,” a grim Naked City about capital punishment, as the warden of the prison where an execution is to take place. On Brenner he was a police lieutenant, on The Defenders a divorce lawyer. For a Route 66 episode filmed in Florida, Gampel – a slim, bald man with a rich baritone and a resemblance to Werner “Colonel Klink” Klemperer – played against type as a southern sheriff, and managed a creditable accent. On Hawk, he was a mob lawyer who, along with a thug played by a young Ron Leibman, blackmails a sweaty Lonny Chapman into signing a false charge against the police. I’m a big fan of Leibman and of Lonny, but Gampel underplays the scene and steals it from them both. Among the reporters to whom Gampel spells out the prison rules in his big scene in that Naked City are Barnard Hughes and Gene Hackman, both then as unknown as Gampel was – and remained. 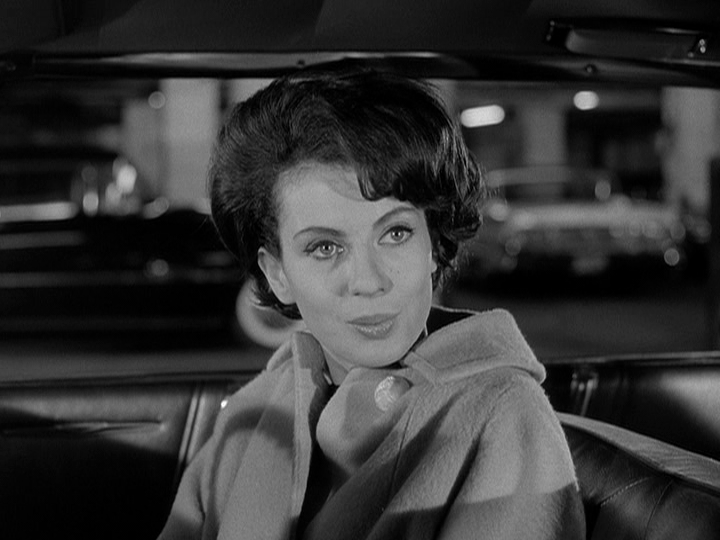 One of the joys of watching the New York-lensed TV shows of the sixties (which also includes a few sitcoms, like The Patty Duke Show, on which Gampel was a guest star, and Car 54, Where Are You?) is the exposure one gets to that group of underexposed Gotham actors. In his book Making Movies, the director Sidney Lumet rhapsodizes about shooting on location in New York because of the quality of the extras. Lumet felt that they had more authentic faces than their counterparts in Los Angeles, who had learned to mug for the camera and were, in their way, just as polished and unreal as the stars and starlets they surrounded. The same thing can be said of the actors one finds in these New York TV shows, too: they’re used to the stage and less comfortable with the camera, less photogenic and more ethnically diverse than their west coast counterparts. I can run down a list of the actors I’m thinking of, but I guarantee you’ll recognize few if any of their names; that’s the point. 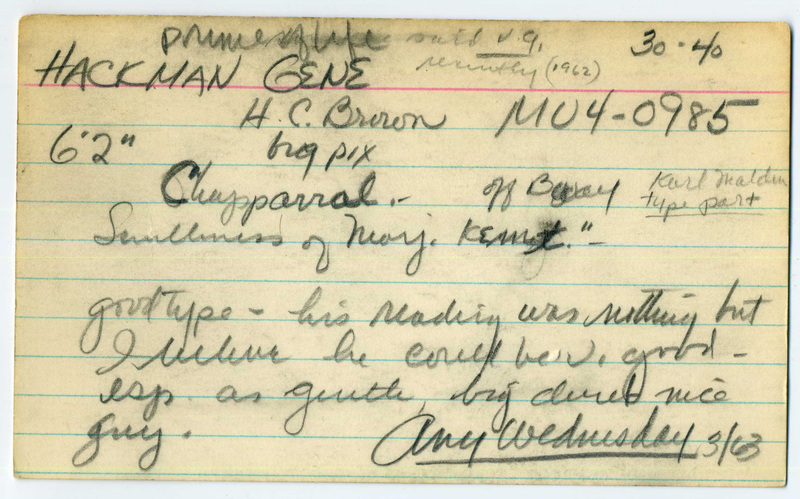 There were Cliff Pellow, Peter Turgeon, Bibi Osterwald, the pock-marked Fred J. Scollay, and the pop-eyed, very Italian Louis Guss. Or Tom Pedi, Salem Ludwig, Frank Campanella (forever typecast as a tough cop), William Duell (one of the oddballs in One Flew Over the Cuckoo’s Nest), and Allan Rich (latterly memorable as NBC president Robert Kintner in Quiz Show). 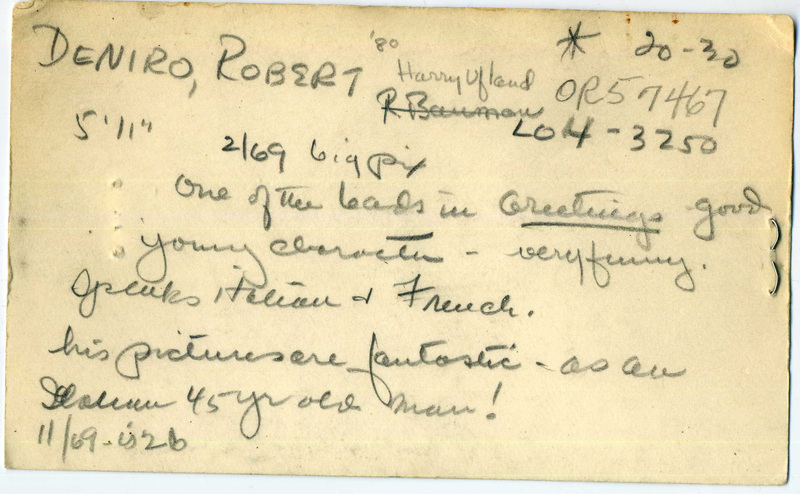 Or Albert Henderson, Doris Belack, Richard Ward, Florence Anglin, Robert Dryden, Jane Rose, Louis Criscuolo, Maxwell Glanville, Joe Silver, Charles Randall, Joseph Julian, Lester Rawlins, Sudie Bond, Lou Gilbert, and John McGovern (a great New England type). Or the tiny, sickly-looking Leonardo Cimino, perfect as a junkie or a hood – and just the kind of actor, so strange in appearance and so scary in affect, who doesn’t get imported for long-term duty in Hollywood. A few of the performers in that group, like Dolph Sweet or Doris Roberts or Sorrell Booke (The Dukes of Hazzard‘s Boss Hogg), moved to L.A. late in their lives and became familiar faces in the movies. But most of them remained on the East Coast for their entire careers, and even for those film buffs who double as connoisseurs of character actors – those of us who can pick, say, Don Keefer or Katherine Squire or Sandy Kenyon out of a Twilight Zone or Perry Mason still – they’re largely an unknown quantity, unless you happen to have programmed an East Side / West Side or NYPD marathon for yourself lately. There just weren’t as many opportunities to appear in front of the camera for actors who chose not to follow the general shift of the TV industry toward the West Coast. One assumes that a love of either the theatre or a distaste for Los Angeles led them to forego the opportunity for greater fame. Instead they spent the bulk of their careers doing off-Broadway and local theatre, logging a smattering of recorded appearances in-between: an arc traversing live dramatic anthologies in the early fifties through Law & Order episodes in the nineties or 2000s, with running jobs on soap operas or bit parts in a Woody Allen film or two in between. C. M. Gampel’s career followed that path, concluding, in fact, with a Law & Order: Criminal Intent in 2003. The New York Times death notice included a handful of other details about his life: he was Canadian, and his real name was Morison Gampel (and he worked under that moniker as well). 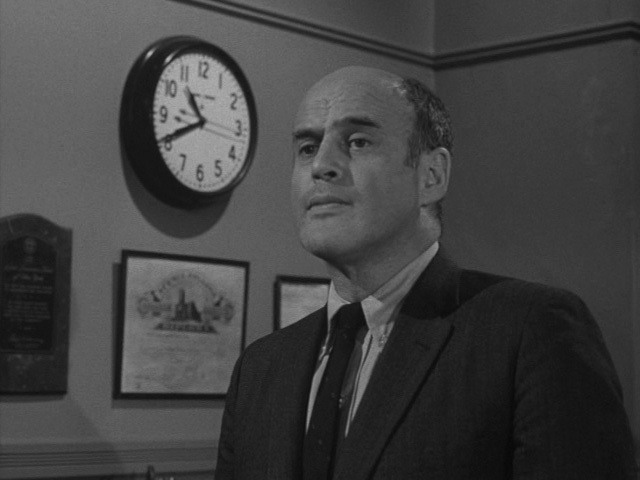 Here’s a shot of him from Naked City (“Prime of Life,” 1963).